Description: This study of the Isaianic Denkschrift (Isaiah 6:1-9:6) is both a traditional and an innovative one. It defends the integrity of the Denkschrift, yet on grounds wholly other than those outlined by the early proponents of the unity of the composition. The present work is founded on an inquiry into the ideological matrix of the composition on one hand and, on the other, on the understanding of the activity of mantic (prophetic) figures in the Near East during the early first millennium BCE that has emerged in recent scholarship. The presentation of Yahweh as a royal character in the Denkschrift is interpreted as an integral part of the symbolic universe promoted by the composition. Several levels of social discourse of the Denkschrift are identified: the author(s) is simultaneously engaged in the creation of Judaean autonomous cultural identity, in polemical activity with the rival Yahwist community (the North, or Samaria) and in the safeguarding of the privileged position of the former Babylonian exiles among the community of Jerusalem and Judah. Two interrelated hypotheses are developed in the book: regarding the historical milieu in which the Denkschrift was composed and regarding the place of the composition in the formation of First Isaiah. As for the first, Prokhorov proposes that the early second-temple community of Yehud matches the profile of a society whose problems the Denkschrift is addressing and reflecting. As for the second, the author maintains the view that the Denkschrift marks one of the final stages of the creation of First Isaiah whose original nucleus consisted of the Hezekiah narrative (now found in chapters 36-39 of Isaiah), which, in turn, modified the respective Deuteronomistic material. 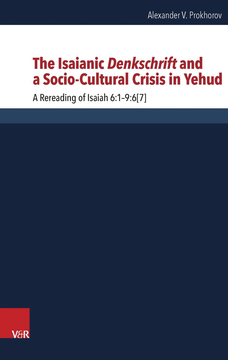 Citation: Csaba Balogh, review of Alexander Prokhorov, The Isaianic Denkschrift and a Socio-Cultural Crisis in Yehud: A Rereading of Isaiah 6:1�9:6, Review of Biblical Literature [http://www.bookreviews.org] (2017).